I spent a portion of the weekend banging around on a band-mate’s newish non-Intel flat-screen iMac. Having lived steadily on a diet of used Macs, he and his wife finally took my advice and moved into the 21st century with the purchase of a new Mac. Problem is that it and their HP multifunction printer didn’t see eye-to-eye. Because I recommended the new Mac, naturally it was my responsibility to put it to rights. They own an HP 6110, a multifunction device (that’s received very mixed reviews on Amazon) that they use mostly for its printing capabilities. It perfectly printed a couple of Word and TextEdit files I tried but failed badly when I attempted to print pages from a browser—the printer would spit out a couple of blank pages and finally print a portion of a page. This behavior resulted in pages printed from Safari as well as Firefox. I tried saving a web page as a PDF file and then printing it from Preview and still saw the blank and partial pages. After repairing permission to no effect and reinstalling HP’s latest drivers with similarly disappointing results, it was time for a trip to Apple’s Discussion forums to see if the problem existed for other Mac users. A search under HP 6110 revealed that the blank-pages-from-browser issue is a bugaboo in both Panther and Tiger and none of the usual solutions fixes the problem. Instead, the trick to near success is to use a different printer driver, specifically the HP DeskJet 600/600c Gimp-Print v5.0.0 beta 2 driver found by selecting the printer in the list of printers, choosing HP from the Print Using pop-up menu, choosing this driver from the Model list that appears at the bottom of the window, and clicking the Add button. When I did so, Web pages printed reasonably well (no blank pages but the print ran off the left side of the page ever so slightly). However, the printer slowed down to about half speed (it seems that this driver prints in a higher quality mode by default, which causes the print head to move more slowly). Although my friend and his family are a little shy about delving into dialog boxes, I installed two printer drivers via the Add button in Printer Setup Utility—the original that prints quickly but won’t print web pages, and the slow driver that prints everything. I made the original, faster driver, the default. After creating the printers I selected each printer in turn within Printer Setup Utility, clicked the Show Info button, and assigned an appropriate name to each: Slow Web Printer and Fast Non-Web Printer. After demonstrating the technique a time or two, my pal and his wife understood that they must select the Slow Web Printer within the Print dialog box whenever they wish to print a web page. And what have we, the non- HP 6110 owners of the world, learned? Two things. 1. If you can find what you seek, the Apple Discussions Forum is your friend. 2. 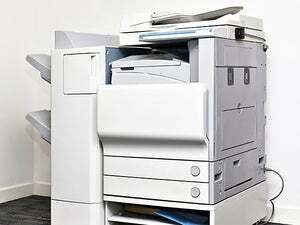 If your printer acts up in repeatable ways, the way out may be an alternate driver.